Which treatments are best for pre-wedding spa? Facials treatments prepare your skin ready for a makeover. If you’re unsure about which one to choose, a prescriptive facial by our therapist will tailor the treatment to your skin type. Great for ensuring a celeb-worthy glow in your wedding photos. Body Massages aim to relax you and iron out any nerves. Let yourself be blissed out for a while before getting back to your plans. Choose a body scrub or polish to treat your skin to an all-over softening glow. Perfect if you’re going to be showing off any bare skin, or just want to feel gorgeous. Manicures and pedicures make sure your nails are in picture-perfect condition. Spa hen party is a popular choice for pre-wedding pampering. 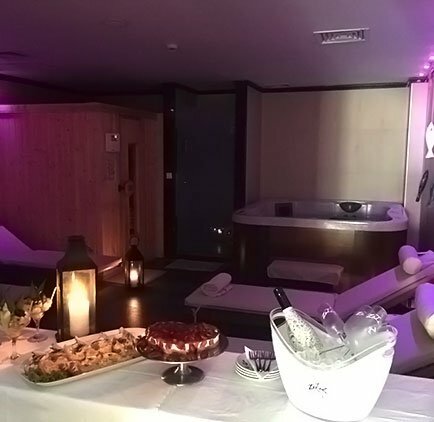 Hen party spa packages give a chance to relax together, to enjoy a cosy moment, to enjoy beauty treatments and catch up over a glass of champagne and a meal. Euphoria wellness spa provides private facilities of Hydrotherapy that you can book by the hour. A perfect hen party spa day would include the private use of Hammam, Sauna, Jacuzzi plus a 25 minute treatment. You can choose your desired treatments between Hands and Feet shape & polish, Aromatherapy massage or body peeling. It also includes a menu of drinks such as Sparkling wine, Champagne or Cocktails, finger food buffet, fruits and wedding cake. You can also finish the day with a lobster menu at the Daphne Gourmet Restaurant in the Albatros Spa & Resort hotel or book a room to overnight in a Superior room with 5* facilities and enjoy the nightlife in Hersonissos summer resort. If you’re the mother of a beautiful bride to be, use the spa as an excuse to spend the time with your daughter as she starts a new chapter of her life. A mother-daughter package includes mini snacks, cocktails or Champagne and a pampering treatment package for two. It also may includes hydrotherapy private use, manicure/ pedicure, a body scrub and balm or facial. You may also finish the day with a lobster menu at the Daphne gourmet restaurant in the Albatros Spa & Resort hotel or book a room to overnight in a Superior room with 5* facilities and enjoy the nightlife in Hersonissos summer resort. A bridal spa package promises total relaxation! It will refresh you and will give the perfect glow to your skin. We offer you the chance to choose the treatments and type of spa day you’d like to experience before your wedding. The bridal package combines facial & body treatment, manicure/ pedicure and relaxation. Bridal spa package treats you like a princess and prepare your body and mind for sparkling confidence on the day of the wedding. The run up to the wedding can be super busy. It might be an idea to just take an afternoon to yourselves. Treat yourselves to a quiet spa day for two sit back and relax in the spa facilities, try an intimate hammam ritual with Champagne and enjoy a massage for two. The Just the 2 of us package includes an hour full body massage per person in a couple’s suite and 30 minutes private use of hydrotherapy with a bottle of sparkling wine. You may also finish the day with a lobster menu at the Daphne gourmet restaurant in the Albatros Spa & Resort hotel or book a room to overnight in a Superior room with 5* facilities and enjoy the nightlife in Hersonissos summer resort. Although bridal packages are more common than wedding spa packages for the men, grooms can also benefit from time at the spa. Book a body or face treatment to help you feel like a king. Try a deep tissue massage or full body scrub and spend time in the Hammam or Sauna. Please arrive at least 15 minutes prior to your scheduled treatments to prepare. As a courtesy to the following guest, if arriving late, we will complete as much of your treatment as possible, but will end as previously scheduled & full treatment fee will be accessed. After registration please fill up the medical questionnaire to provide us with the necessary information for any special needs. In case, information is incorrect, the administration of the spa is no responsible for medical complications. Please notice that the treatments in Euphoria Wellness Spa are not carried out by medical doctors. Lockers & Private Changing Rooms ,Fresh Towel Service, bathrobes & sandals , disposable underwear , hair dryer & cosmetics are provided for your use and comfort.